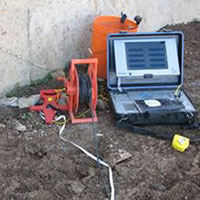 Foundation test equipment can be used to determine the depth and integrity of existing bored pile foundations, to perform crosshole logging tests on piles with logging tubes installed and to measure more complex foundation layouts such as shallow or deep pad foundations or bulk concrete foundations. 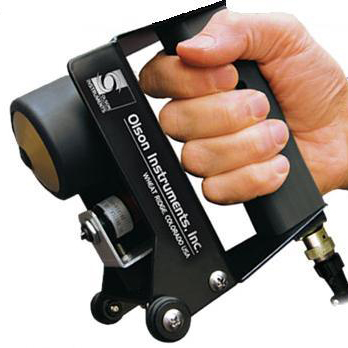 The Foundation Test Gauge (FTG1) is a new compact pile and shaft inspection tool utilizing the Sonic Echo test method, otherwise known as the Pile Integrity Test (PIT). 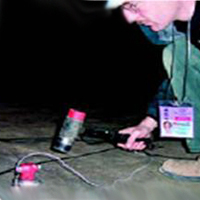 Sonic Echo / Impulse Response (SE/IR) investigations are performed to evaluate the integrity and determine the length of deep foundations. SE is the same as the PIT test. 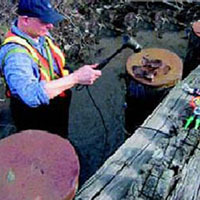 Crosshole Sonic Logging (CSL) is the most accurate and reliable technique for assessing the integrity of deep foundations, it requires logging tubes be cast in the pile or slurry wall. Parallel Seismic (PS) is a method that is applied to determine the length of deep foundations where foundation tops are not accessible or for long or slender piles. 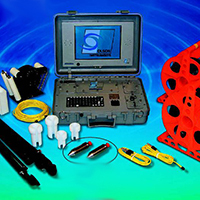 Ultra-seismic (US) investigations are performed to determine the length and evaluate the integrity of shallow and deep foundation elements. Access to the top of the foundation is not needed. Impact echo testing can test foundations of up to 1.4 m in depth, ideal for pad foundations and testing waffle slab style construction.